Prakash Ambedkar, grandson of Dr BR Ambedkar, on Wednesday launched a virulent attack against the Rashtriya Swayamsevak Sangh (RSS), alleging that the weapons displayed by the organisation on Dussehra are meant to be used against Dalits as Muslims have slipped under its radar. 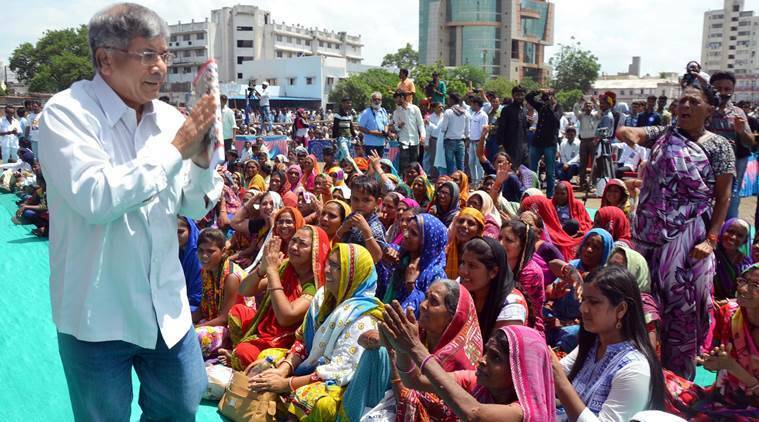 Prakash called upon Dalits to end the Hindu right-wing organisations’ “project of Manuvad”. “I want to ask this question to RSS, which is in power today — who is your enemy? Come Vijaya Dashmi or Dussehra, they hold fairs everywhere and perform pooja of weapons. Such worship by kings and rulers was understandable as they had to protect their kingdoms. But today, we are independent. Nobody is ruling us. We are our own rulers. So, what is the need of this mentality of oppression? 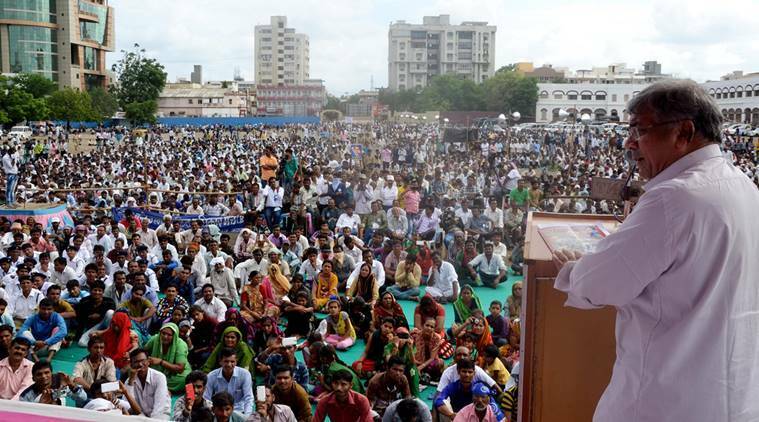 We need peace, development and fraternity,” Ambedkar said while addressing the National Dalits Rights Conference, a meeting of Dalits from various states from the country here in Rajkot. Ambedkar said the saffron organisation was out to implement its ‘Manuvad project’, for a society in which Dalits are subservient to the upper-caste members. “We want to ask the RSS, which is out to establish a system of oppression, who do you want to use these weapons against? Elements from Pakistan come here and go back after triggering bomb blats. But has anybody ever heard if a sainik of RSS, Vishawa Hindu Parishad, Bajrang Dal or Gruh Rakshak have gone to Pakistan and triggered a blast there? If somebody goes there and returns after triggering a blast, I can understand their worship of arms is meant for Pakistan. But as a matter of fact, they are scared of Pakistan. “Atal Bihar Vajpayee went there with an army for a fight. But he couldn’t draw his sword and had to run back. RSS spokesperson (Seshadri) Chari told Times Now channel that next year, independence (liberation) day of Pakistan will be celebrated. I think the trained army of RSS should be sent to Pakistan for starting a fight. This is nothing but hypocrisy. They warn Pakistan but fight against those at home. Therefore, I want to ask RSS as to against whom is your worship of arms is aimed at? Is it against Dalits? You have already sidelined Muslims and now you are after Dalits,” Ambedkar said to a long round of applause from the big gathering of Dalits, Muslims and tribals. The meet was organised by NGO Navsarjan, Rashtriya Dalit Sangh and other organisations. Ambedkar exhorted Dalits to fight the RSS indirectly. He said smaller temples in the country were collecting Rs 40,000 crore annually in form of offerings and donations, and that this money was used to run the Sangh and purchase weapons. He appealed Dalits to stop going to temples and giving donations to religious organisations. If this offering stops, he said, half of RSS branches will shut down. He appealed to Dalits to study the character of the Hindu right-wing organistion before taking it head on. “Figures show that incidents of atrocities against Dalits have been on the rise. It is a different matter that such cases happen in villages. But this is systematic attempt to oppress. They want to instill fear and create an atmosphere of terror. And what is their motive? They know, Dalits can fight and if they managed to suppress the voice of Dalits and Ambedakarvadis, there will be nobody else to challenge them. They will then have a free hand and their intention is to impose Manusmuruti. Babasaheb Ambedarkar’s entire fight was against this very Manusmruti,” said Ambedkar while appealing to Dalits to forget their differences and give up their sub-caste group identities. The mentality of RSS and BJP is to impose themselves on others whereas those respecting the constitution believe in fraternity and equality, Prakash said. “They don’t know to respect any agitation. They believe that what they do is always right and that you will have to accept it at any cost,” he said. Prakash also took a dig at Prime Minister Narendra Modi, alleging taht his empathy for Dalits was hallow. “Modi said shoot me. But we want you to live. However, you must make it public whose words are these? From whom have you stolen? Declare this or we shall expose you on September 16,” he said. He also said that the Dalit Swabhiman Sangharsh Samiti will launch an nation-wide agitation to demand for their rights and that the first public meeting will be held in Delhi on September 16. Dalit and Muslim leaders from Maharashtra, Rajasthan, Punjab, Haryana, Uttar Pradesh, Jarkhand, Odisha, Karnataka, Tamil Nadu, Chhattisgarh will also participated in the conference and addressed the meeting. Speaking earlier, former BJP MLA from Rajkot, Siddhar Parmar also attacked VHP leader Pravin Togadia and BJP saying they had pampered “goondas” like the ones who assaulted Dalits in Una and that the incident had united the community.